Welcome to the Bible Journaling Course for Beginners! We’re so glad you made it to the Bible Journaling Course for Beginners registration page. To learn more about Bible journaling and this course, play the video or go ahead and enroll. There’s absolutely no cost. If you have any issues with the form below, just click here to enter in your name and email and we’ll get the course out to you. Module 10: Bonus* Shhhh…it’s a secret. This course is not for you if you’re looking for art lessons. There are many great artists that provide art lessons. You can view some of them here. Our courses are more about growing closer to God rather than whether or not the art is perfect and correct. You should also not enroll if you are looking for advanced techniques. This is a BEGINNER course. It’s designed to for people who are not currently Bible journaling or are looking for a foundational course. How Can I Start the Course? The first email that you receive includes the first course. You’ll receive the next class on the next day for ten days in a row. You can save the emails so you have access to the course at a later date. Especially if you’re busy. We just ask that you open the email so that our system knows you want to receive our emails. Thanks! We recommend that you take begin the course prior to buying supplies so that you don’t over buy things you don’t want or need. A list of budget supplies and high-quality high-value supplies is provided in class #1. How Can You Stay In Business If You Give So Much Away? At this time Bible Journaling Ministries operates at a loss, but we hope that it won’t be for very long! We don’t ask for donations. We try to give away as much as we can, including this Bible journaling course to encourage you to grow in the Word. We make a small fee when you click on our links and purchase items that we recommend, any of our products or courses, and we are also supported by Ads. We never recommend something we wouldn’t buy ourselves. Yes. You can share this Bible journaling course…but share this page only. Please don’t share any of the course pages or the password that you get. It’s unfair to the person who is taking the course if they don’t go in order. We also don’t want to have to put a virtual wall up around this course. It requires extra login work for you and extra money on our side. We prefer to spend our money on the freebies we make for you. Thanks! Absolutely! Just click the “unsubscribe” link on any of our emails and you will give your seat up. You won’t receive any emails or get notifications from us including our monthly freebies. We don’t want to send you something you don’t want! Every email we send cost our ministry money. If you’re not opening our emails (or if you don’t mark us as safe and we get a bounced email) we’ll eventually remove you from the list as well. Do I Need DropBox to Download the Bible Journaling Class Files? No. You don’t need DropBox to download the class files. All class files will be delivered via email. Can I get a the Bible Journaling Course on DVD? You’re welcome Robin! I’m so glad they are helpful! At the top of the page under the video is where you sign up. Love this course! Just what I was looking for! Thank you! Great stuff love learning all this stuff about bible journaling. Hi Tracie, I’m new to Bible journaling. Just learned about its existence and I’m searching for where Bible journaling courses and found your website. Excited to learn more about it. Is there a dvd, if so, how can I get one? Glady’s that’s a great idea! I don’t have a bible journaling dvd, but maybe one day in the future. Thanks for asking! In enjoying this course so much .you make everything so simple a r easy to follow. Thank you for sharing your idea at no cost at all. It’s very creative, inspiring and most of all a great way to motivate us in learning the Word of God. Your so kind in helping people get so interested with these kind of bible journaling. Thank you for all these great ideas. More power to you. I am giving you a ☆☆☆☆☆ rating. God bless. Tracie, I signed up for this course, unfortunately I then had big time problems with my computer. I got the emails but could not down load anything or navigate in the email there fore I could not get any of the courses. I was not able to join in at all. However I did send you an email to let you know of this problem. Computer problem is fixed and I see a place to sign up again so am going to see if I can get in. If not then I really regret it. I never received a response to my email which I fully expected. I could get the emails but could not get into any of the links inside them. I’m showing that you opened class 10 on 10/3 in our system. If you scroll down on that email you’ll have the links to all of the classes 🙂 I”m glad you got your computer fixed. If you dont’ see our future emails (there are a few that have been sent to you and some have been opened but others haven’t), please check your spam and move our email to your safe list. That way you’ll be sure to get them! Traci at this time I literally have no money to buy anything unfortunately. But do you have anymore free items that I can download at least to get started. Because I love everything that you have. I’m on state and disabled and only make $200 and that has to go to my bills. But as soon as I’m able to get more money I DEFINITELY want to buy alot of your items. Sandra – are you on our email list? We give away freebies every month! How long does it take after signing up to get the first course? I signed up yesterday and haven’t gotten it yet. Thanks for offering it free! What a blessing you are being to many people. You should get it in about 5-10 minutes. Please check your spam. It often goes there first. This class has helped me to take the FEAR out of bible journaling. I purchased the INSPIRE bible and now I have started and I cant stop. I’m enjoying this class. I don’t have all the materials we’re learning about, but I am saving the emails so when I get the materials I can go back and watch them again. Hi, Well I had to hold all the lessons for a while, but I just finished listening to all of them and learned a lot. I’ve taken notes, printed several printables and am ready to continue. You are so easy to follow and understand, my only comment…I wish I could have enlarged so I didn’t need to lean into the screen, but I managed. Or it might work if something you were showing were held up to the camera to get a really good look. I enjoyed this Bible journaling course and learned so much. It really encouraged me to keep trying and not give up. I am not at all artistic so appreciated all the ideas and have begun using some of them. Thank you for your enthusiasm and encouragement. I’m trying to find the section for the free June calendar. Thanks for your help. It’s in the email. Please make sure you’re signed up or check your spam if you haven’t received it. I think this is an excellent course, I will recommend it to my family and friends. Thank you. I am so glad you enjoyed it. A referral is the highest form of praise so thank you! Great course! Love every lesson! Since I only joined recently the module that has been most helpful is the one about finding a Bible verse for me. Oh yes…that one is a fun one. Did you see my expression when I picked JOB? I get a kick out of doing that technique. It’s great to know the difference in the mats and how to use them. I’m glad that class was helpful to you Tina! This course has been great 🙂 Learning so much, especially that I don’t have to stress about not being perfect. I can just relax and worship the Lord. YES!!! That’s exactly the point. It’s all about HIM. Well done Dawn. Thank you for the comment! It’s been very helpful and encouraging just to be myself and journal according to what I can do. It’s not about the art but the desire to spend time in God’s word. Amen Renee! Bible journaling is about spending time with God. Thank you for sharing. This class is so well thought out and informative! I’m new to Bible journaling and this is getting me excited! Awesome Karen! I’m so glad the Bible journaling course for beginners is helping you take that next step. Kudos to you for going through the lessons! Love that I have learned that I don’t have to be perfect nor what I create. Learning do much about myself. Amen Pamela! It’s all about being in the Word. Your welcome Cindy! I’m glad the bible journaling series is helpful to you. Yay! Thank you for allowing me in the group, and thank you for all you do with the videos to help us newbies. You are awesome. You’re welcome Tammy. So glad you’ve joined the Bible Journaling for Beginners Facebook group! Yay! THANKS SO MUCH FOR THESE SHORT BUT INFORMATIVE VIDEOS. I AM NEW TO BIBLE JOURNALING BUT WANT TO BECOME BETTER AT SPENDING TIME WITH THE WORD AND BIBLE JOURNALING IS SUCH A GOOD WAY TO DO THAT. You’re welcome! I’m glad it’s helping you on your Bible journal journey! The things I like the most about these classes are you are so down to earth and friendly. I love all the info you have to offer. But I really like the GOD Bible Study Method!! Thank you for making such a great resource free. I was really looking forward to participating in your free 10 class bible journaling course, but unfortunately, I only received emails for 4 classes. I’ve even scanned my spam, promotional & other folders to no avail. The 10 video course was wonderful. Thank you so much for all the great ideas, inspiration, and tips. I would highly recommend the videos to anyone just getting into Bible journaling. Thanks, Tracie! You’re welcome. I’m so glad the Bible journaling course is helpful! Thank you so much for these courses! I am totally new at journaling, and in the process of gathering some things that I will need. Your courses are very helpful. I look forward to a closer relationship to Christ! Thank you for all you do! I love this Elaine – how amazing for you to grow closer to Christ. You’re most welcome. Praise the Lord! Your approach to teaching and your presentation of the materials is awesome! I like the way you both talked us through as well as visually showing us your techniques. Excellent for both the literal and visual student to absorb the lesson. You are able to casually (in a good way) get your point across using a very down to earth, humble dialogue. Kudos to you now and as you continue on your teaching ministry. This review is long but hopefully informative. I stumbled over bible journaling by “accident”. After watching YouTube videos on bullet journals and adult coloring books whilst wondering if my renewed love for art could be incorporated into my life to bring me REAL joy, I came across a video done by Tracie on her book review of” Complete Guide to Bible Journaling…”. I’m certain I heard my heart sing. What a wonderful way to incorporate real joy i.e. God’s word and art. I bought the book which really is a wonderful resource but still felt intimidated by the “professional” work the artists created. I wanted something for beginners, something that would provide step by step instructions and these videos definitely met those expectations. The book and other resources are now used with confidence. Watching these videos was like getting help from a childhood teacher who demonstrated patience and clarity to make learning fun and fast. My three (3) recommendations are (1) If you can, please invest in good supplies. I purchased a few brands of colored pencils, then based on reviews, I purchased Faber Castell Polychromos (referred to as FCP going forward) and what a difference they made!!! Compared to the scratchy cheapER pencils, they colored like butter. I wish I has just taken all the money I spent on the others to purchase a larger set of FCP. (2) Do research on supplies because I’m sure you worked hard to earn your money. I chose FCP over Prisma Premier because the latter has a soft core, therefore breaks easily. Recent reviews (late 2016/early 2017) indicate that they arrive broken ( no lottery style pencils for me!). I press hard so already fragile pencils aren’t a good match and lastly those pencils require technique to sharpen, I prefer to hone skills on more important tasks. Btw Prisma has a line called the Scholar which are for budding artists and require less care. (3) Watch the videos before making purchases. I wish I had watched her video on how to make a bible mat before I purchased a 7′”X 8″ Illustrated Faith mat that is somewhat too small for my bible (at least now I can make a replacement) and secondly, if you also purchased the fore mentioned book and researched the featured artists like I did, most sell their courses , so free is rare. Why not support this ministry by using the affiliate links for supplies you are going to buy anyway? Although I have been faith journaling for awhile now, I am learning some new tips and techniques in this course. Thank you for providing it! I’m always learning too! Thank you for your feedback – I’m glad it’s helpful even if you’ve been Bible journaling for a while now. Thanks for your enthusiasm for this ministry! Just enrolled in this video class am enjoying it very much. Watched the video on your many Bibles. I have a collection also that includes my grandmother’s Revised Standard Version Bible and one of my mother’s. I was wondering if you ever saw “The Story”? It reads like a book and my grandchildren really like it. It is also helping me even though I have been a Christian for a long time there are parts of the Bible I still struggle reading. Keep up the great videos and teachings. Thank you Betty. Yes! I was given The Story by a dear friend of mine. It’s a lovely version. I should’ve mentioned it when I talked about The Message. I totally forgot!!! Only 3 lessons in and already inspired to walk this journey in God’s Word! Yay! So glad. Thank you for sharing! So far the one that’s been most helpful is the one on choosing a journaling Bible. I have loved all three so far and am looking forward to the rest. Yes – finding the right Bible can be confusing. I’m glad the Bible journaling course is helpful so far! I love how this course makes bible journaling easy and fun . Yay! Bible journaling is easy and fun! So glad you enjoyed it! I am a “newbie” to Bible Journaling and this course was really helpful. I learned a lot. Thanks for offering this. Thanks for your comment Linda! I’m glad the Bible journaling course was helpful!!! You bet Linda! So glad it’s helpful! Excellent beginners course! Thank you so much for the time and effort you put into creating it. Also, for sharing your gift so freely. Thanks again for getting me started on my Bible Journaling Adventure. Sending blessings to you all the way from The Bahamas. The bahamas sounds fantastic! I’m so glad the Bible journaling course was helpful Vanessa! So glad it’s helpful. Have fun Bible journaling in the Bahamas – I should come join you. Yay! I’m so glad the Bible journaling course is helpful to you Cyndi! Thank you so much for all of your video’s they all are wonderful and very helpful. One tip I really needed to see was erasing the graphite /pencil before you start coloring. I have made this mistake. Thank you again, I love spending time in my Bible. Vicki – thanks for calling out that tip! It’s so important if you’re concerned about blending in the graphite with the pencils. I’m so glad you’re having fun in the Word. Keep it up! Thank you Diana. That makes my heart sing. I’m so happy our Bible journaling courses have been helpful to you! Thanks for the class. Very helpful! This course has been helpful so far, especially the part about how to choose a Scripture to journal. Thank you! Fantastic Christine. Thank you for sharing. I’m glad you liked our bible journaling classes. I really enjoyed the videos and all the help. Thank you for being so informative. I’m so glad the videos in the Bible journaling for Beginners course were helpful Carla! New to the whole Bible Journaling journey and am so grateful for these beginner videos! Thank you for all the hard work and time you put into teaching others about the process. You’re welcome Debbie. It’s my pleasure! I learned a lot from your course and I am not even a beginning Bible journaler! I especially enjoyed the sections on ink and gesso. I think I let myself get intimidated about gesso and now I am ready to give it another try. I also used your Bible choosing tool and found it very helpful – there are so many choicces available today! You really helped me navigate through them all. Thank you so much for all the hard work you put into this course – I really appreciate it. Thank you for this course! I am finding it very helpful! Fantastic! I’m so glad it’s helpful! I am loving all of your videos! They are so helpful for someone who doesn’t know much about bible journaling and just starting out! I love that you link products also making it easy to find things you mention in your videos!! Thanks Tracie!! I have really enjoyed watching the journaling videos so far. You made me feel better about not having to have an artist talent to be able to do this. Your tips are easy to follow, and I really am looking forward to trying them! Thank you so much for helping me get excited in just another way of expressing my love for God’s Word! Hi Traci, So far I have enjoyed the Quick Start the most. This can all be a bit scary and overwhelming but the lesson simplified it for me and took away some of the intimidation I felt from looking at other people’s beautiful work. Thank you! Beautiful course Tracie! I have a new hobby! Thanks so much Sandy! I’m glad you enjoyed it. Thank you for posting these videos. I really liked the video on protecting your work space and bible. I was looking at the Ranger mat in the store and decided not to buy it. I like that you talked about it in the video so now I’m going to try it out. You’re welcome Mythis. I’m really glad you liked the videos and that they’re helping with Bible journaling. This course has been helpful to me. It got me to open up my inspire bible and just start. Looking forward to learning more. Thank you. I am learning so much and getting some great ideas. Fantastic Chris! I’m so glad!!!! Thank you for giving me a easy and joyful way to start Bible Journaling. I’m not an artist and have trouble drawing a straight line so drawing pictures in my bible is daunting to say the least. Your videos are inspirational and easy to follow. Thanks again. You’re welcome Martha! I’m so glad the Bible journaling course is helpful! This course has been tremendously helpful to me! Thank you for taking the time to make these videos for beginners. I’ve loved the helpful tips for us beginners that I would have never thought of, like what pencils to use or what tip-ins are and how to make them. Thank you again! Thank you so much for your comment Sharayah! I’m so glad it was helpful. I am looking so forward to an increased awareness. In all that is Bible Journaling. Thank you for this giveaway opportunity ! Thanks so much for this opportunity you’ve given us! I appreciate your teaching manner. You are thorough, easy to understand, and offer actual products for comparison – especially choosing journaling Bibles. I have looked at many but, haven’t made my decision as to which one. I wish the journaling Bibles didn’t have cream colored pages though. I am most eager to learn about Gesso. Thank you for your comment Carole! I’m so glad that you like our teaching style 😉 Let us know if you have any questions when you get to teh gesso course! Have fun!!! I am enjoying your bible journaling videos. Thanks for sharing all your learning. Fantastic! I’m so glad that these videos are helpful! I live in Germany does anyone know where I could get some of these mats and any other materials that Tracie Rollins is talking about here? I am new in all of this. Thank you Tracie for all you do. Hi Lianne – head over to our Facebook community. I think we have some folks from Germany that might be able to guide you. These courses are very helpful. Finally found the time to start watching all the videos. Great videos. I’m so glad they are helpful!!! I’m really enjoying the series, Tracie! The Beginner’s Community on Facebook is such a nice complement to the lessons & so welcoming! Following you on Instagram, too! Thank you so much for this very insightful course on Bible journaling. I am not gifted artistically….at all…but I want to communicate and draw closer to God through this beautiful expression. Right now, I have only vventured so far as to put a few stickers in the margins. I am trying to summon up the courage to actually draw something on my Bible page! I have so enjoyed your instructions and suggestions to get me started. I am so inspired to “just do it” when I look at all of the beautiful work that is shared on your facebook page. Thank you again for helping me expand my expressive creativity! Cant wait to get this going. Sounds just what I NEEDD but couldnt afford to buy. Also think there is something real special about people who give info to others instead of sell. Not meaning anything negative to anyone either. If you can get info about him in any way it A-OK.I appreciate all the work everyone -puts into spreading the word of our Lord.So thank you for all the information you give us . You are in our prsyers. Thank you also for teaching me to do something I knew nothibg about. May God bless. I’ve been dabbling for a while – but never knew the “proper” way to do some of the things you covered in the classes… The explanation of the different mats was most helpful1 Thanks again! Thank you for all you do to help inform and educate us in skills to make us more inspired to study God’s Word and use our creativity as a form of worship! You’re welcome Cheryl! It’s my pleasure! I am loving all your teaching in the video’s. Thank you so very much. You’re most welcome – it’s my pleasure! I have found the videos helpful so far. I have only watched three. I liked the one that gave all of the ideas on how to find which scripture to journal about. Thank you so much for putting these videos together for everyone. You’re welcome Lee! I’m glad the Bible journaling course is helpful! It all has been most helpful…I like knowing others preference on journaling supplies and bibles. I also found it interesting on the different types of bibles. I am a Bible buff too, I own between 15- 20 bibles and have my eye on more. Just today I tried to get them all out and put on shelves together but can’t find a few of them. (Small cluttered house) Each time I use a different one, I say to myself, “I really like this bible.” lol I don’t have one that I don’t like. Thank you for helping us all to learn more about how to jump into bible journaling. ????❤???? this is my first time Bible Journaling. Your videos have helped to understand how to. What materials to use. I also like that you give the materials at the end of each video and what they look like. I’m excited!! This course is a great compliment to my bible journaling group at my church as I am new to this. I like how you present everything simply so it’s not intimidating. That’s fantastic Becky. I’m glad it’s helpful to you! and full of ideas if you are not good at drawing like me. I find your verse of the day inspiring and look forward each day to them. Thank you, Tracie. The information on the different types of Journaling Bible’s available was very useful. This course is really inspiring me to Bible journal more. Thank you and GOD Bless. Fantastic! I’m glad you were inspired to get in the Word! I am so glad that I stumbled upon this. And the biggest bonus is that it’s free. I am one who wants all the info I can get before I start doing it. I am a perfectionist so I appreciate the advice given before I venture out and do it. I am afraid I’ll ruin a bible and I want to be able to read what I color/paint over. So far the classes have been very informative and I am looking forward to learning more. Thank you for sharing your wisdom and knowledge with me. I’m glad the course was helpful to you Debby! What an amazing concept & the ideas on here are just incredible! Hoping to get some of these supplies soon. Looking how to make my own bible mat. Thanks so much for this course! Enjoying very much! 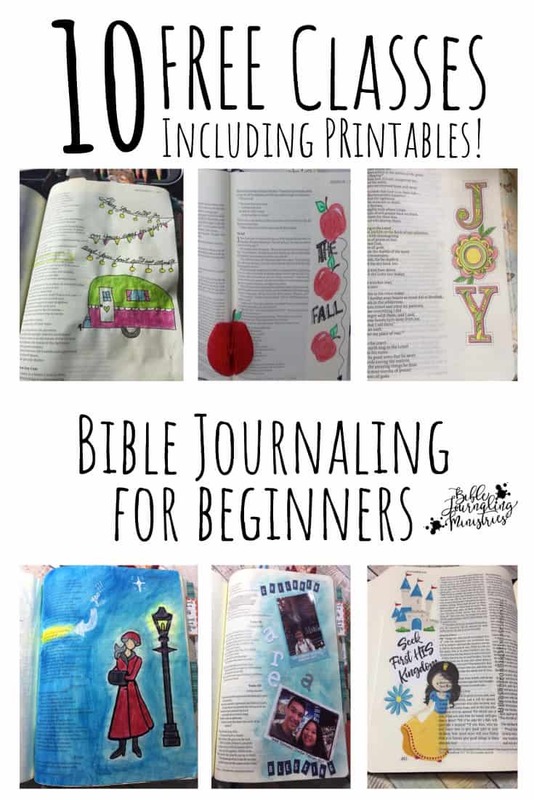 I’m so glad you are enjoying the Beginners Bible journaling course! Really enjoying all the video tutorials and doing a bit of practise in a journal while waiting (at least 4 weeks) for my new bible to arrive. Then I’ll hopefully be ready to get started properly. The time taken has been really informative. Jill thank you for letting me know. I’m so glad the Bible journaling videos are helpful! I am so glad to be a part of this group. I really appreciate all of the advice and tips that you share in your classes. I am excited to get started with my journaling! Glad to have you in the Bible Journaling for Beginners Facebook group too! Thanks for this free bible journaling course. It’s been so helpful in creating new ideas and love your review on products. I have really learned a lot from these videos. The best parts are that they’re thorough, paced well and a taught with a teacher’s heart. They tell you what you will learn, they teach it, then they review and wrap it up. Very few videos are done this way and I for 1 day BRAVO!! Thank you so much Kathe – that means a lot to us! I have so enjoyed this course so far and look forward to new videos each day. Thank you for all your hard work. You’re welcome Barbara! Glad the Bible journal course is helpful! I am enjoying this course so much. I have been wanting to get started in Bible journaling and didn’t know where or how to start. This course is providing the guidance and at the right speed for me. Love it!! Thanks you for offering it for free. You are most welcome. I’m so glad it’s helpful! I found this class so helpful as a new beginner to Bible Journaling. Many questions I had been wondering about were answered in the videos . I’m a visual learner so seeing the application was very helpful. I’m super grateful for the free printables as well! So glad the Bible journal course is helpful. Thank you for letting us know! I have really been enjoying your videos. I’ve been wanting to start Bible Journaling but just didn’t know where to start and you really helped me out with this. Thanks so much for sharing. Please continue. You’re welcome Reina! So glad you’re starting on your Bible journaling journey! Thank you for these helpful ideas. Thanks so big for the helpful ideas. I have been enjoying the classes a lot. I only have one journaling bible, which is the Inspire bible. I liked seeing the different types that can be used, or even a non-journaling one, The tip on putting something in between the pages is a great idea. I never would have thought of doing that. I use colored pencils mostly, and sometimes gel pens, and putting something between the pages will make things a lot easier for me. No indents on the next page. Thanks for creating this class and making it accessible for anyone to take. I had been thinking about Bible journaling for a while but was a little intimidated by the beautiful artwork and layouts I had seen. Your videos have helped me feel more confident and taught me that I can do this! They contain such great relevant information that has helped me immensely. Thank you for your hard work and for providing this valuable resource. Love the Bible Journaling Videos and can’t wait to get started. Your videos on choosing a bible was timely with me ordering the Inspire Bible online. Thanks for this great ministry and for all you do. I’m enjoying Tracie’s videos and all the helpful hints. I’m slowly getting the courage up to journal and draw and color in my Bible! I look forward to all that God is going to show me. I’ve really enjoyed your Bible journaling classes! Spending time and digging deeper into God’s word through doddling and artistry has made it a little easier to just become encompassed in the arms of my Father! I have not only enjoyed the classes you are sending but I have also started having my own private Bible study in the mornings before work. I feel a spiritual growth like never before! I’m truly loving it! That’s such good news Kim. Thank you for sharing! This course was very helpful and informative. I’m hoping there will be a free intermittent level course someday! Thank you for this free beginners course and all the helpful tips. Thank you so much Tracie for your ministries! I’m new to Bible Journaling and was unsure of even where to start but, you have given me so much knowledge and inspiration, your a true blessing! I do enjoy your videos. I am very grateful that I can go at my own pace and watch them when I have a few moments of free time. Thanks for showing us the correct way to transfer pictures. I am enjoying the course, Thank you and God bless. I love that it’s gives me a chance to focus on learning. Thank you! Thanking you in advanve for the printable and for your time. Thank you so much for these informative videos! I stumbled across Bible journaling while I was in a lengthy stay in the hospital and have found it to be uplifting and encouraging — a balm for a weary soul. You explain various methods of artwork in such a way that I’m able to easily understand and not be frightened. Thank you most of all for encouraging us in the importance of being in God’s Word.! Tracy – I pray that you’re doing well and no longer in need of a hospital. I’m glad the Bible journaling course was helpful to you! Thank you for letting me know! Thank you so much for this course! I have loved it! I love this. I great up knowing I was not allowed to write in my bible. Then as an adult, I started writing notes in it, gasp, lol. Now you are enabling me to color and I’m so glad I found this. Yay! We’re glad you’re here Jody! Thanks for this course! It is helping me learn how to get started and I am loving it!! I have been enjoying this course, it gives lots of great tips and ideas about how to start, makes it less scary and helps me relax and enjoy my time with God’s Word. Thank you Kim! We’re so glad it’s helping you spend more time in the Word! I look forward to your lessons . Love spending time with God and all my pretty work. I have LOVED this introductory Bible Journaling course. Thank you so much for making this available! Would definately rate this five stars!! I loved the course, thank so much for doing this and taking time out of your day for beginners like me. you make it look so easy, I love spending time with the Lord, I am looking forward to applying the tips you gave us. Your class has been a definite help in giving me ideas in how to get started with Bible journaling. Thank you for offering the free class! Great course, love the lessons…Thank you! I’m learning so much from your videos! Thank you! Maybe I missed it, but how do You do single scripture journaling? Has that already talked about? I’m a newbie to Bible journaling so everything is new to me. I just wanted something to help me to be eager to read my Bible daily and I think I have found it in Bible journaling. Finding your website and videos have been very helpful with understanding how to use this to help enhance spending time with God and reading his word! The videos that helped me the most were how to figure out which scripture to read and journal on, choosing the right Bible and the list of accessories you need so I didn’t go out and get unnecessary things I wouldn’t use. I would definitely suggest the series of videos you offer for FREE to anyone thinking about Bible journaling but not sure or new to the experience! Thank you!! Thank you for the informative videos. Just bought some small craft mats and now i need to run and see if they have any small holes! Love the videos!! Very informative and helpful. I’m form Johannesburg South Africa…………. Thank you for you heart. Welcome! I’m so glad you had fun!!! Thank You so much for the information on the different ways to Bible journal and materials to use. Supplies needed and which Bible I might like. Thank you so much-a great blessing! I did not receive module 1 and 2-only 3 and 4 so I am wondering why! Jennifer – check your spam, promotional, or “other” folder. If you still can’t find it, email me (reply to one of my emails) and I will get it to you. So glad it was helpful thus far! Thank you for the great instruction and tips you have shared. I am really enjoying learning about Bible journaling. I am totally disabled and this is becoming a great way to worship and express myself. Thank you!!! Thank you so much for doing this video course, Traci. I am excited about getting started. Each video is so helpful, and I wish I had watched them before ordering any supplies/materials. Your first video, showing how you can journal without ANY special materials/supplies has been the most exciting. Yes, I already have some material/supplies, but I see there is NOTHING legitimately standing in the way of my getting started. Just do it, girl! (I’m telling myself.) Thanks again! Loving the lessons and your Facebook group! Thank you so much for the opportunity to join in on the bible journal. I truly enjoyed as well as had fun! First thing in the morning when the hubby goes to work is my quiet time with (Daddy) to read, meditate and be still with him. All I can say is thank you again and may God continue to bless all that you do. I have just recently joined and everything I have seen has been helpful. The bible mat video really helped me as I cannot afford some of the more expensive mats but you gave good alternatives to those that I would not have thought of. Amazing tips! thank you for the help, I’m a newbie at this and your resources have been very helpful! thank you so much for all the hard work you do here, I really enjoy the videos and love your website. I also love the printables you offer as I am not very artistic and they are great for tracing into my Bible. I love this course and your Youtube videos. I had several “coloring” Bibles but wanted to do more than just color. Simply coloring seemed disconnected from the Word. Journaling the Word actually makes me focus and absorb the Word like never before, You can focus on a verse or a certain theme, person or time period. I love the Lord and this simply helps me draw closer to his Word. Thank you Tracie, you are a blessing. WOW… great bible journaling course… want to get started quickly now with other pages than the 3 I did so far!!! Hello. Thank you so much for making this course free for us! I’m a newer Bible Journaler and I’m learning so much. I think what’s been the most helpful is how to find scripture to Journal. Sometimes I get stumped on what to do so that was super helpful. And also how to make your own Bible mat. My budget is kind of short so getting ti make things a little cheaper makes me and my husband a bit more happy!!! I have been trying to start bible journaling for quite some time. You made it easy to understand how. Thank you for the study. It was awesome. Thank You for all of your free courses. I am brand new to Bible journaling. I love your relaxed attitude! It helps me to relax and focus on what the scripture is saying to me. Thank you for this. I’m not sure where to leave my name and email address. Look like you found it! Glad you’re on board with the class! For those of you who can’t fine the sign up… check that you don’t have an ad blocker. Thank you so much for offering such an amazing class!! I have learned so much and finally was able to take the plunge and start journaling. Again thank you for all you do!! I am totally enjoying this class. Lot’s of very good information. So far the info has helped me know what items are available as well as several different options, so that I can best choose which ones will meet my own personal needs best. tysm. I am a complete newbie to this, though I have admired others’ works for quite a while. I thank you for offering this course for free, I appreciate that 🙂 so far I have enjoyed just learning about the different types of Bibles, what is best for me to use. Thank you. Such great videos Tracie, As I have always been the artistic type, I just love how I can combine that passion with my new journey in getting closer to God. Enjoying the class. It has been a busy few days so I didn’t get to look at the first few classes till today and I am getting to sit and go through them today. I am glad I have a few to watch because it would be driving me crazy to have to wait on the next lesson. We are so blessed to have you offer this class to us. I am really enjoying the information in the classes and I’m getting the feel of being able to create art while I do my studies. Thank you sooo much! Have a great fouth of July holiday! I am fairly new to bible journaling so your videos are very helpful to me. Lesson 4 was very helpful with the tracing of templates. I look forward to learning more! Thank you so much for the videos! I have signed up but haven’t received an email. Does it automatically get sent? Can you please check your spam folder? I see that we’ve sent a few to you! These courses are very informative and good. just what I needed as a beginner in Bible journaling. Your tutorials and Bible art journal techniques are incredibly informative and useful for all beginners. Thank you! Very helpful and informattive!Got several questions I had answered on it. I loved the Bible Journaling instruction was awesome. I had tried journaling in my bible before, but just didn’t know where to start. I enjoyed every bit of it. Thank you so much for offering this and helping me learn it is not as overwhelming as I originally thought. Thank you, Tracie, for all you do.!! I love your classes! I’m not a paper crafter so I didn’t know anything about printing my own stickers of have a sticker maker. Thank you! Thank you so much for offering the 10 day class on bible journaling. I’m so excited to get started. I purchase the My Creative Bible and today I ordered the Inspire large print. The classes help to guide and direct me in my spiritual journey. Although I was on youtube searching for the video that would grab my attention and I was blessed to come across your video. I was all over the place, now I’m at peace. Now I can focus on the word and a creative way by having my intimate time with my Abba Father. Again thank you for your imediate response to my emails. Much love and blessings! I s enjoy your videos. You are so very helpful. I am new to this so I am glad I found your page. Everyone on here is inspiring. I love the simplicity of the videos. But so effective! Really liked the explanation of the different Bibles. I am learning so much. I finally feel like I can be creative. Thank you for your ministry. Tracie, thank you so much for the work you are doing. I stumbled across your blog 4 weeks ago and you taught me how to understand what I was reading. I have only been a Christian for about 6 years and have read the Bible many times since then. I read, but could not comprehend what I was reading. Having chosen to follow your July’s Challenge I am learning to comprehend somewhat . Some of the passages you chose were quite easy to find “waiting”, but others I had to really wrap my brain around what they had to do with this challenge. As a result I dissected the verses and experienced several aha moments and really got the message. I now believe that God directed me to your blog. Thank you, please keep doing what the Lord has placed on your heart and God Bless You. That’s fantastic! I love that you dove deep into the verses to pull out what God wanted you to see. Thank you for sharing! I’m the opposite of most – I mostly enjoyed the crafting part, but am finding that it helps me to be more inspired in my spiritual walk as well. Thanks for the encouragement! I want to say thank you for everything that you do helping people learn how to Bible Journal. I didn’t get to start it right away… But I wanted to do it when I had time to do it undistracted. I really am enjoying it. Thank you for the course, without it I would never had courage to get started ???? Love what I have seen so far. I was a little confused when I first became familiar w/Bible journaling, thinking it was just making things look pretty (which is fine, but not something I could really wrap my head around.). I LOVE the emphasis on Bible Study and that what the page actually looks like is secondary. Thank you for your generosity in providing this resource!! Thanks for all the information. I am new to Bible Journaling and I can use all the help I can get. I’m excited to have joined the bible journaling ministries, each week I’m eager to learn more! Hi, I just love interacting with God’s Word in Bible Journal!!! Makes me feel closer to God! I really want to start bible journaling . I have a lady that go to my church and she was putting some stuff on fb and I was like that Is so cool . Hi Tracie, I have really enjoyed these 10 free classes on Bible journaling . They have been a great help to me in getting into God’s Word. Thank you, Tracie, for the great lessons and for all you do. God’s love shines through in all of your lessons, tips, and techniques. Thanks again, Tracie. You’re welcome! I’m so glad they were helpful! been so helpful. Thank you so much! Thank you so much, Tracie! The tutorials are great! I am on lesson 4 and I am enjoying them all so far. I am learning a lot. Lots of fun and very informative. Thanks! Well I have over bought but I am off the couch and sitting in front of ny window and thoroughly enjoying every creative minute ! My Bible is beginning to be very bumpy as I add more and more. Absolutely wonderful beginner course. Short, sweet, and hard to beat! I love that you are very succinct and get right to the point of the lesson. I have searched for something like this but just happened to stumble upon this course. I have been wanting to learn how to do this for quite some time. I also have been collecting random supplies when I see things I like but have been to afraid to use them. I’m anxiously awaiting the second part of the course on techniques. Thank You, Thank You, !! I just finished the 1st Bible Journaling Course for Beginners, and found it to be so very helpful to me. I am now ready to start my journaling with a little more confidence. I am sure that I will refer back to the videos for refresher . Your videos are easy to follow… you take your time… very enjoyable. I forget all stuff on my mind when journaling and enjoy studying God’s Word. Keep up the work you do for us Tracie. Appreciate it and love it. Absolutely LOVE this series of Bible journalling videos. They were all loaded with wonderful information. Thank you so much for this ministry. May God richly bless you for your selflessness. Thank you so much for this course!! I look forward each day for my emails to come through and to watch the videos! All so far have been so helpful in starting my journey into bible journaling. I am from the UK and no one I’ve spoken to has heard of it!! I love being a part of your Facebook group, getting inspiration and showing my own work, this has been such an eye opener for me and is making me spend 100% more time with God and in His Word! Thank You!! I am teaching a young group of ladies in church the art of bible journaling, and you had everything I needed in a good layout that I could share with them. Love the free items that I could share as well!!! That’s fantastic! Hope it goes well. I’d love to hear about it! I’ve done a lot of paper crafts so a lot of the techniques are familiar to me, but it’s great to learn how to use them specifically for Bible journaling. I would have never thought of using my indispensable craft mats (I actually have two!) between the pages as shown in lesson 4. Great ideas! I am really enjoying this online course. Just started a week ago and love it. I also make greeting cards. I am amazed that there is so many supplies that I already have I can use in my bible. Thank you for taking your time and making these videos and sharing them with us. I have really enjoyed this course. It’s one of the best ones I’ve taken because it walks you through the basics and Tracie is so personable that it’s like sharing a cup of afternoon tea with a good friend. The course is broken up into bite sized, manageable pieces and the downloads are really sweet too. I love the owl printables. They are a hoot! If you are a seasoned Bible journaler or someone just starting out, you will really enjoy this course. I highly recommend it! So much fun and a great way to draw closer to our wonderful Lord and Savior! I would love to have a cup of afternoon tea with you! Wouldn’t that be fantastic? Thank you for all of you help and tips . Love your course. I loved this course! Especially the videos about supplies. With so much out there it is so helpful to know which items are worth investing in. I can’t wait to watch more videos from Tracie! Thank you so very much for these free courses! I am just starting on my very page & am both nervous & excited! Hope you have a very blessed day! I’m really enjoying your videos. They are very informative and I’m looking forward to more! Enjoyed every lesson and will start using what I learned. Still what I call a beginner in journaling. Thank you for the courses they are really helpful and a daily encouragement. This is a very good course. I am so glad that I found you and I love the Bible journal pages. I have made me a Bibke Journal. So that I can stay on track with my bible studying. Writing things down seems to help me. I’m enjoying the videos, and gathering supplies. I just haven’t gotten the courage to start. My handwriting is so bad even a pharmacist couldn’t read it. But I’m going to start in a journal then go from there. Thank you so much for these lessons. I have learned so much and am really excited to try what I have learned. Awesome and very intresting course! Your beginner’s course is awesome! I have learned so much and you have a great list of resources. Thank you so much! I look forward to the email everyday to see what you have for us. Loving these videos. So much good information. Tracie I just love your class! It all has been so helpful! Thank you so much! Thank you for this course! Each video is short and I have learned something. I hadn’t thought about how hard I pressed. Thanks for the explaination on the different Bible translations. Loved your expression when you turned to Job, lol. Love all the tips and techniques, Thank You!!! The time and effort involved in creating these classes is greatly appreciated. Thank you. Tracie, Thank you for sharing this course with us. Lots of great information. You made it real easy to learn a new hobby. Thank you for your freebies. I so enjoy the honest and sincere manner in which you present your videos. One can see the love of God working in and through you. Thank you so much for the time you have invested in Bible journaling and teaching others how to begin. I am really finding all of the tutorials helpful and inspiring. Hi, thanks for the classes! I enjoyed the way to find a bible verse the most so far. Also enjoying how you use watercolor pencils. Thank you !! The classes so far for Bible journaling are very helpful. I needed to have it explained and broken down so I could wrap my mind around it. It’s such an awesome way to dig deeper and learn God’s Word and make It so personal !! I’m enjoying the videos! I just got started, really, this week, and just watched the video about protecting the Bible and surrounding surfaces. Very helpful. I’d seen the Ranger mat and the Illustrated Faith mat before, but I’m interested to see your video about making one’s own. Thanks for all this. I have many supplies, but have found it hard to get started. Thanks for the useful information and the encouragement to get started! That’s awesome Vanessa! Thank you for letting us know! I am new to Bible journaling, and these classes are really helping me to learn how to make this experience a joyful time with th Lord. This new way to worship is going to put the “tons” of scrapbooking supplies I have to a beautiful use. In a way, this is scrapbooking my journey with God and His Word. Your classes are helping me to understand this new worship art form. Thank you very much for all you do! Blessings! I have just found out about Bible Journaling and your videos are amazing. I especially enjoyed the video on the different kind of bibles! Wow, I could not believe there are so many different Bibles to use! This has been a great course to get me started! I am enjoying your classes, thank you so much for sharing these. I am in the uk so where to get things from over here is just a case of searching. This is all new to me but have enjoyed the first couple of times I have journalled in my Inspire bible, I love it! I discovered Bible journaling on Pinterest and just felt straight away that as I am a creative person and love God that this would be a wonderful way of Worshiping Him. I am just so excited that I can bring my two loves together this way. Looking forward to the next class ???? I’m half way through the beginner’s course and I’m really enjoying it! I’d recommend it to anyone wanting to start Bible journaling. It’s given me the freedom to just start and not worry about my skills or making it look perfect – the focus is on God and not my lack of drawing ability! Really enjoying your videos. You have definitely found your calling as a teacher. Thank you for using your gift to help us get deeper into His word. Thanks so much for your dedication to helping others like me understand not only the importance of being in the Word but how to do it in a fun and interesting way. I just signed up for Momentum and am looking forward to many happy hours learning in the near future. God bless you!! So glad to have you as our newest member of Momentum! Welcome!!!! A great course for getting a complete beginner to Bible Journaling started, but even as a more experienced papercrafter I found it useful. The freebies are lovely and I now have some more items added to my wish list! Thank you so much for this course. I am a more advanced Bible Journaler but I have learned a thing or to. The downloads are great as well. I’m loving this free course and all of the tips for beginners. Thanks a lot! This course is very helpful. It has calmed all of the fears and answered all of the questions I had about journaling in my bible. Thank you so much!! Thank you so much for these wonderful videos! They have got me started of on the right foot with my Bible Journaling journey! Thank you so much for doing these wonderful videos! They have helped get me stated on the right foot with my Bible Journaling Journey. Thank you Tracie! Going through the class step by step is great. I would never have known where to start or what tools to use without this class. Thank you!! Thanks so much. My daughters gave me an inspire bible for Mother’s day this last May, and I have wanted to ,earn more about Bible Journaling since. Your course came at time I needed to seek God’s voice. Thank you for the free course. I found the classes very helpful so far. I liked the video on how to find scripture to journal. tutto bellissimo! meraviglioso modo di leggere la Parola di Dio! grazie! Thank you for the videos – they are VERY helpful! I just watched the one on protecting your Bible – great ideas! I will be looking for the resources! I’m really enjoying The class so far. When I thought a Bible journaling I always was overwhelmed because it just seemed like it would be so difficult. However, your videos have made it so much less scary for me . I’ve got my inspire Bible now and my pencils so I am almost ready to touch the page ???? Great step by step directions and guidance in each video, glad I signed up for this series. I took this course twice. I found it very useful and learned quite a bit. I hope to start the second sessions soon. Very useful tools. I’m so glad I discovered this course! I really wanted to know more about Bible journaling after buying the Inspire Bible, and this course is just perfect! Thank you! Thank you for this beginner’s course. I loved how it was just one video per day which made learning the basics not seem overwhelming. I looked forward to each day’s lesson. I appreciate the time and thought that went into creating this course! Tracie, Thank you for your clear and concise hints and tips. I was excited as each module hit my email inbox and appreciated your work & dedication. It’s wonderful to be able to spend more time in God’s Word and enjoy it, feeding our souls at the same time. Thank you for having the insight to share your heart and gift. I look forward to all that you have to share in the future! I loved the beginner videos; and so far I have watched the first two Momentum ones about prepping the page. Thank you for all of the great information! Thank you for making these classes available to us non artistic folks who want to use art in our worship expression. Picked up some good ideas that I have already used and some others that are just out there waiting for me to use. Thanks so much! I am so enjoying Bible journaling ministry. It is a blessing! Hi Tracie,I’m on day 5.excited to learn some new techniques.yesterdays beginners course on protecting your bible i was reminded on something i have used.alot of stores sell window clings and i always keep the backing for my granddaughters to draw on because they wipe clean.and they also can be used under your pages when painting so your over splatter doesn’t get every where.just wanted to share. Thanks for all you do and all you share. I learned alot about Bible journaling techniques from Traci’s first course. I don’t have alot of margin space in my Bible so I plan on tracing some Bible bookmarks that I found online, coloring them and inserting them. Thank you for all the information you provided, Traci. Though I have done scrapbooking this is so much different. Many things to take into consideration and this has been tremendously helpful. In addition to the fact that you are meditating on God’s word. Our Sunday school class is studying spiritual warfare and doing the War Room bible study. I don’t have room for a War Room so I decided to do a binder instead but I’m a scrapbooker so I really wanted some ideas for how to tie my love for art into my studying. To be honest I haven’t had time to do much of anything yet but I can see the hours of work you’ve put into this site and the beginner class and I’m humbled to be allowed access for free. It’s a wonderful blessing and encouraging for me to dig deeper and get more out of my bible study. Thank you so much for the wonderful course. I hope to start journaling in a new bible soon. I really liked and appreciated the free course! It was very helpful. Thank you so much! I totally agree with the review by Jeanne H. I wish I had found your series of beginner videos a couple of months ago. I too feel totally overwhelmed with the beautiful, colorful art pages featured in most of the book about Bible journaling and love your beginner suggestions. I bought a journaling Bible and was completely paralyzed at the thought of drawing or coloring over the words of scripture. After making lots of mistakes and ruining several pages of the new Bible I decided to “go for it” and try some of the full page artwork, tip-ins, etc.. Since it was already “ruined” I figured I couldn’t mess it up worse than it was. Now I have a second Bible that is still pristine after a week of trying to start journaling in it. Your videos have given me ideas on how I can begin more slowly with it. I love the clear label sheets to make see-thru stickers. I’m a little intimidated by the price but after your video I can see where they would be a good idea. I really appreciate your tip about putting washi tape on the page before doing tabs–great idea! The pages are thin enough to tear so easy, I’m sure the tape would really help firm them up. Than you for the free series and I’ll be sure to watch your other videos on YouTube. God bless your ministry. Thank you so much for providing these wonderful courses. Each and every course so far has been so helpful and I hope to begin journaling very soon! Thanks again!! I enjoyed this course and found it very helpful. I was very apprehensive about writing or coloring in my Bible but this course offered tips and advice and I will hopefully be able to start soon. I have very recently come across the concept of Bible journaling and am enjoying every bit of this course. I must admit that I am somewhat still intimidated by the thought of writing let alone applying color in any fashion in the Bible but I have purchased a journaling Bible and am anxiously awaiting delivery of some clear gesso to prep the pages. In the meantime I’m absorbing as much info as possible. (Who says that you can’t teach an old dog new tricks). Thank you so much for these lessons for the true beginner into Bible journaling. This Bible journaling course is VERY informative & enjoyable. is also very prompt in answering any questions that you ask! Thank you so much for all your courses!! I’m halfway through the course and loving it so far. I recently received the ESV Illuminated Bible for review on my blog and decided I wanted to try my hand at Bible Art Journaling. I wasn’t sure where to start though. Someone pointed me toward your course and I am ever so thankful. I plan to start January 1st as it is the day I am starting my chronological 3-year journey through the Bible. Thank you for offering this course for free. Thanks a lot for these lessons !! !They are a great blessing to me! The tips are so helpful, the downloads amazing, and the supplies suggested are also cost-effective. Way to go, Tracie Rollins! Please continue to be a blessing! The course is very motivation with the you tube tutorial and learned that I can design and make my own bible. Tracie – you have made this so simple and helped me get over my fear of “doing something wrong.” Thanks for the immeasurable amount of work that has gone into your ministry. A very interesting course, full of useful tips for a beginner like me. Thank you so much for sharing this for free – it has definitely helped put me on the right track. I am so glad I found this class. I’ve been thinking about starting bible journaling since I realized my journey in Faith Bible Institute was coming to an end. Something to encourage me to continue to be in the world regularly. I had no idea where to start and this has gotten me off to a good start! Can’t wait to get my journaling bible in! I had heard a lot of people talking about journaling and I wanted to learn. So glad for this course. Thank you for making it available. This course not only took the fear out but also showed ways to do it without necessarily having all the tools. I am so thankful for the information as well as the how to videos that were such a blessing to me. I hope to overcome my fears and use the knowlege to draw closer to God and HIS word. Thank you again! I am so grateful for you sharing your talents with us!!! I love bible journaling but am not artsy so I love having great helps like yours!!! I learned so much! I can’t believe all the info packed into these videos. It took me more than 10 days to do the 10 classes, because I wanted to go slow and absorb the Bible verses as well as the methods of journaling. Thanks so much, Tracie. Thank you so much for this ministry. Enjoying the beginners course immensely! I have enjoyed all the lessons so far and find them all very helpful. You are very easy to follow. Such great resources. Thanks for your awesome work and assisting me through bible journaling!!! Tracie, thanks for all the great information. I love the video’s , the supply list and what you need to start. Thank you so much for doing this. Your GOD method has worked wonders for me! I’m finding it much easier to dive into His Word and don’t put it off like I used to do. I love the Bible journaling class for beginners. I connected with the Facebook group and get to see other journal pages as well. Thank you so much for these classes! Thank You so much for the course. Loved watching the videos. Love the Bible journaling course! I purchased my journaling bible for Christmas and still hadn’t gotten up the nerve to do anything with it until now. I love your personality and the influence you put on being in the word and being closer to the LORD instead of worrying about how it looks. You’ve finally given me the courage to start my first entry! Thank you! I love this course!! It’s great!! Thank you for all the great ideas and instruction! I just got my journaling Bible and can’t wait to begin! I have really enjoyed the Bible Journaling lessons. They were excellent. I look forward to learning more. You are doing a great ministry, Tracie. Hi – I just finished watching the whole course and absolutely loved it. My husband watched with me and we looked forward each day to spending time with you. I’m thrilled to learn that you will now be sending me the next level. You’ve taught me a lot and I really appreciate your sharing your experience. Blessings! Thank you for these videos,! I am really enjoying them . I have been looking at buying a Journaling Bible for a while but I was never sure which one would be right for me. After watching your class on bibles and using your guide, I ordered one! I am so excited for it to get here and to be able to dig deeper into Gods word through creativity. I like each one of these videos how they are informative on each topic without spending excess amounts of time. Thanks Again!! Thank you so much for providing all of these video lessons. You did a nice job of explaining all of the steps along with suggestions for the materials that I might need. Lots of good tips. I look forward to learning more from you. Thank you again. Hi Tracie. Thank you very much for the informative free classes. They have helped me a great deal so far. I’m up to the 5th class so far. Thank you very much for the info on the Ranger craft mat. You saved me some money because I was about to order the cheaper brand and if I would have bought it and messed up my other page, oh I don’t even want to think about it. Lol. Thank you from saving me from passing out. Have a blessed day and enjoy it. God Bless. So glad you didn’t pass out 🙂 You’re most welcome! I am new to bible journaling and this course is so informative and helpful. The lessons are short and easy to follow along. I loved the tracing video and will be trying this!!! Thank you, Thank you, Thank you! I have enjoyed going through the emails at my pace. The information on which Bible is right for me and the craft mats have been so helpful during this wonderful journey. I am only half way through the lessons, but can not wait for more helpful tips and information. You’re welcome! It sounds like you have a great plan moving forward. Glad you’ve invited mom and sister to join in! Thank you Tracie for the free first course. I really loved it. I learned a lot and it saved me money in the long run (the lesson you taught on the Ranger mat.). Thank you again for the course. I learn a lot of important things. God bless. This has given me the confidence Start bible journaling. Thank you for providing information all the basics for beginners on how to bible journal! Thank you for the free course. I have been wanting to get into bible journaling and just didn’t know where to start. Now I do! The lesson on tracing was very helpful to me. I had already downloaded the John 8 resource but did not know how to use it. I really like the GOD Bible Study Method!! Thank you for making such a great resource free. You’re welcome! Thank you for letting us know you liked the God method! Thank you so much for doing this course. I loved it. It has helped me so much. I can’t wait to learn more from you as we explore God’s word with Journaling together. I love the lessons and look forward every day to what I can learn. Thank you in my journey with God as I become closer to Him every day. I really am enjoying this course, Tracie! I’ve just started in my journey of Bible journaling and was so overwhelmed with all the information that is out there. Your lessons have really given me a great starting point along with wonderful ideas. Thank you so much! I have been wanting to Bible Journal for about 6 months. I caught your course from Pinterest. I think it is a great beginner course and answers a lot of questions that I was having. Thanks for the “nudge” and offering the course for beginners for FREE! I am disabled and on a VERY limited budget. Your free course allows me to begin journaling and get a greater understanding of God’s Word. I am a visual learner, so this course is GREAT in that respect. Thank you again, for offering the beginner course for FREE. Thank you for sharing yor gift of creativity. I’m learning the process and you made it easier. Thank you for the beginners lessons I learned a lot. And they where fun. Este curso me ha ayudado a perder el miedo para hacer bible journaling, yo compré una biblia de apuntes edición ilustrada y me daba miedo hacer cosas en ella, ahora ya puedo hacer cosas sencillas, pero perdí el miedo de no dañar la biblia. Thank you so much for the fun, easy way that you explain things Tracie. I’ve really learnt a lot working through this videos. So happy to have received this course for free. This is an excellent way for people to experience the teaching methods to see if it is a good fit for their learning style. Thank you! Thank you so much! I have enjoyed all of the lessons so far and I am excited about starting my Bible Journeling! Thanks! Can’t wait to get started. I love the courses so far. They are really informative. Can’t wait for the rest of them! I am just getting started with the class because I went away on retreat to the Living Proof Live conference in Boone, NC this weekend. What I have looked at so far has been wonderful. I love printables and think that having the option to print on clear stickers is awesome. Also enjoyed the reminder to trace designs in our bibles. Thank you for this course! I’m just getting started in bible journaling and so the tips and advice are very helpful. I appreciate the way you remain encouraging, and your willingness to share traceables because it’s still a little intimidating to get used to the scale of the pages! Thank you for working so have to provide amazing resourses. I have been enjoying this class so much! It has been very helpful in learning bible journaling. I love how you are covering every question I needed to know. Thank you so much for this course! I have really been enjoying the Beginner Course. I am happy to say that, even though I already knew a lot of the information, I still have several “take-aways”. Thank you! I truly enjoyed your lessons and look forward to begin bible journaling and growing in God’s word. I thoroughly enjoyed the bible journaling courses. I am excited to put the ideas in my bible as I grow in tne word and my personal relationship w my Savior. Thank you and may God bless. Thank you so much for thus course. It is so helpful. I haven’t seen all the videos yet but am saving them to look at when I get chance. Very helpful so far. Thank you for the free journaling course! I am not a beginner but definitely learned a few new tricks. I would give this course a 5 star rating and recommend it to all beginners. It is packed with information that can get you started on your personal journey! Thanks again for sharing all your hard work & knowledge with us! I’ve had my journaling Bible for awhile now but besides coloring the pages, was never really sure what to do. I love what is shown and taught in this community! It’s gotten me inspired and it’s making me step outside of my comfort zone, while still bringing me closer to God. Thanks for all the ideas, help and encouragement! I have learned so much from this course. I have enjoyed this and will be using what I learned in my Bible journaling. I have enjoyed watching your Beginner’s course that explains everything that I will need to get started. Your videos are very easy to understand and follow. I am looking forward to the other courses. Keep up the GOD work. Thank you for the Beginners Course. You make it sound so easy and are so encouraging. I know that you will hear “Well done good and faithful servant.” I’m looking forward to diving in when my Journaling Bible arrives tomorrow. I’ve been enjoying your classes so much. I didn’t know where to start with bible journaling and this has really been helpful. Thank you so much for these free classes! This course is a great tutorial + learn more about bible study! I am learning a great deal in this course. And thank you for the free downloads! I love your lessons. Thank you for taking the time to do this for all of us. LOVE the way you’ve done this class!!!! It does not require a lot of supplies at all to get started!!! Works well with people that are on a strict budget!! My daughter and I have enjoyed your videos. The “Easter Bunny” surprised us with a My Creative Bible in our baskets. We are journaling together. That is so awesome! Sounds like a great Easter bunny to me! This Bible Journaling Course for Beginners is amazing. I have little experience with Bible Journaling and I really enjoy the fact that Tracie Rollins created a course that starts out with the use of simple resources for those like me (who cannot even get all those fancy and expensive materials in the heart of Africa). her videos and PDFs are really a big help and encouragement. Love the easy to follow videos. Getting so much from class even though I have been journaling for a while. Have learned so much. Beats figuring it out on your own! I am brand new to Bible Journaling and this course is a goldmine of information. I especially like the downloads. I’m new to Bible journaling. The Bible journal course for beginners is really helpful. I really liked the video how to find scripture, specially the randomly choice. Also how to trace images. Looking forward to the rest of the cource. I am halfway through these videos and they are great, I look forward to my email each day for the next in the series. They are a wonderful introduction for beginners like myself! Thanks for making this available for us. Thank you for producing these simple and short tips on how to start bible journaling. Thank you so much for this course.I am so new at this and look forward to each days lessons..i am learning a lot..I cant wait for my bible to get here so I can begin. Tracie, love your ecourse. the most helpful to me was the idea of using tracing paper. i don’t knoe why i never thought of using it but i have been doing it the hard way with a light 7 not doing a very good job of it . I am only up to class 5 (a little behind) but so far i love what i am hearing and am looking forward to listening to the other classes. Thanks so much for these quick videos. For those of us that are new to bible journaling, it makes it easier to know that you are understand what to do and it gives you courage to take that first step. I am so truly enjoying this and all I have learned from you in my new bible journaling venture and walking closer with God. Thank you for all you do! I have loved these videos. When I first signed up I didn’t know if I would have time to watch them everyday , but they are short and to the point and I have loved them! Today I learned how to trace a picture into my Bible. Looking forward to finishing it tomorrow. Thanks for making it free so that we can watch and decide what we really need. Love your course! I love seeing all of the bible journaling pages in pinterest, I haven’t done any yet. I especially like the video about tracing, I am not an artist and the tracing video will be really helpful when I do my first page. Hopefully soon i will be able to get a few supplies and get started! Thanks for all off the great info, your videos are so easy to follow. I really enjoyed the videos! Thank you for taking the time to help everyone learn so many new things! Thanks so much for being such a blessing. I am learning so much as I am starting on this amazing journey! Trace, Loved this course. there was always something each day that I learned. Thank you for allowing me the opportunity to take this course for I can only imagine how hard this course was to put together. I am thoroughly enjoying the course. I have just started my walk with Christ and am praying this will help me to grow closer to God. Thanks for your AMAZING ministry!! Thanks this was so helpful! Lots of useful tips and ideas to get me started. Plus just encouragement. Thank you so much. I am learning lots of tidbits to get me going on Bible Journaling. Thank you so much for these wonderful videos and helpful resources! Bible journaling has enriched my time in the Word and has flourished my walk with the Lord. Thank you for your heart for this ministry. Really enjoying the course – picking up so many tips and so much encouragement to just do it and enjoy it. Thanks so much! Thanks so much Tracie! While I’m not new to bible journaling, this class has been fun and a great reminder of the fact it doesn’t have to be spendy. I’ve loved the lessons! Great course! I so appreciated the tips and guides of studying! I enjoyed this series of tips — very helpful to a beginner! I especially liked that each one was brief and to the point, without too much extraneous talking! You got the point across, with good demonstrations. I have really enjoyed this course! I am not an artist and was looking for a way to express my creativity with simplicity. This was it. Thank you so much for making this course free and showing me how to get started with the very basics of Bible journaling. Thank you so much for your time and work in putting this course together. So helpful. Love how you put it in sections as there is so much information floating around it gets a little confusing. You keep it organized and easy to understand. Thank you. I am loving this course you have blessed me with. Bible journalling is only just taking off in Australia and I want to be on the ground floor as it does with the ability to share with others this wonderful way to worship. As someone who has just discovered Bible Journaling I love the very practical tips on how to protect work surfaces, pages, what types of items work best, etc. And as someone on a currently strict budget I really appreciate that you’re generous enough to offer these videos for free. Thank you, and may God bless you as He promised in Luke 6:38 with “a good measure, pressed down, shaken together and running over… poured into your lap”! Thank you so much….I have gone from collecting information and ideas on Bible journaling to doing it…so many thanks. the course was well presented , clear, and encouraging. Keep up the good work. Enjoying these lessons. Clearly presented and explained and the links to supplies are great. Although in the uk, it’s easy to find the items in amazon.co.uk. Thanks Tracie. The 10-day course has been sitting in my email for several months now until I have the time to watch them. I can’t believe I waited so long! This has been incredibly helpful! I can’t wait to buy some carbon paper to help with tracing! Glad you had time to watch it! Thank you for all your hard work on this course, I’ve been enjoying it a lot and have learned a lot from it. May you continue to be a Blessing to everyone that searches to have a closer relationship with our Father God!! Easy to follow courses! Thank you!!!! The course is been very helpful so far. Thanks for the great tips. I am just getting started and am waiting for what I ordered. I want to get started but should I wait till I get my supplies? I am just now having a chance to watch the videos. I am learning a lot thanks so much for sharing this information. I am excited to get started! Tracie thank you so much for putting 10 days of Bible Journaling together. I am new at this and it was very informative and helpful. I am now excited to get started and share with friends. Thank you so very much for a thorough, well thought out and executed course! It covered everything a beginning Bible journaler needs to know. I highly recommend (and appreciate) it! The “how-to” of tracing is so helpful! I’m looking forward to other tips and techniques. Thanks for helping to get in the Word in a creative way! I’m loving the videos! I go to a class once a month and your videos are keeping me going in between! I’m not creative but I can copy so gradually I’m getting braver. I really like The printables! Thank you! I am loving this course and learning so much. Thank you Tracie for your ministry. Great course! Really fun and interesting! I’m new to Bible journaling, and this course is very helpful. Thank you so much!! I have really enjoyed this course. It’s everything a newbie like me needs to get started Bible journaling. Thank you for this important ministry. I’m really glad you named it a ministry, because that is what it is! God bless you and your efforts!. I’ve loved learning about bible journaling so much through the lessons! I’m not very artistic when it comes to drawing and things like that so it’s been an encouragement to see I can journal with out needing to be perfect! I am so glad I found this course! I am completely new to bible journaling and this class is making me feel confident that I can start creating work that reflects my relationship with God and not worry about my artistic skills. I enjoyed all the lessons. Gives you a overview of all the typical questions you might have about bible journaling! Thank you for all the lessons so far. Lesson #5 using carbon paper was a nice touch. I haven’t used carbon paper in such a long time. Now I will get some for myself. I’m not so great with words but it is a great course. I have learned a lot. I’ve really enjoyed learning about Bible journaling, especially things I already have around the house. Thank you for providing these lessons! Can you kindly send me a cactus download? Let me know how I can get a copy. Your lessons have helped me as a beginner immensely. Can you please send an email to support@biblejournalingministries.com? Lonny can assist you with what you’re looking for. Thank you! I am really enjoying the beginners class! I have learned so much & it is leaving me so inspired & motivated! Thank you!! Hi Tracie, I really enjoyed the free online Bible Journaling course. As a beginner with no artistic ability, I felt so comfortable and encouraged by your lessons. You are so considerate regarding any constraints we might face (finances, time, abilities). Your teaching style is so personable and relaxed, I never felt stressed. I was amazed by what I created and how the Word opened up for me. God bless your ministry and may you continue to bless us with the gifts He has given you. Tracie, I love watching your videos! They have been tremendously helpful without being overwhelming! Thank you and may the Lord pour out His blessings upon you!! I am leaving a Bible Journaling class this fall and this information has been great. I will definitely be sharing your website too others! Thank you for the classes. I am really enjoying and learning a lot! I have enjoyed the Facebook page so much. I love seeing all of the drawings, coloring, Bible Journaling, the positive comments and the encouragement that is always given. Thank you for teaching us a new way to study scripture and God’s Word. I appreciate it very much. To God the glory. I just received Lesson #5 in my email. I am enjoying these courses so much!! I am a little behind on the videos – Life happens. But I did take the quiz to tell me which Bible would be right for me and have ordered it. I should have it in hand on Friday, so I can really get started. I am not much of an artist so I am thankful for the ideas. Thank you for your ministry. I love the beginners course. You’re asking what i liked from lesson 5. You are giving very helpful tips how to start journaling. It is very helpful . Hi Tracie, I have really enjoyed taking your course. I haven’t yet begun bible journaling, but have everything I need, except one. I really want to use Gesso on my pages. It’s on its way. However, I am so excited to start, because you make it look so easy and fun. I am looking forward to spending time with God in this way. Thanks for this course! This was a great stepping off point. I’m only on day four but so far this has been very informative and helpful. I can’t wait to actually get started journaling and using your beautiful resources. Thank you so much for going to the lengths you have to make this available to me in my home! Hi! Thank you so much for allowing me to sign up for this course and allowing us to sign up for free..it has help me especially the transfer video. I never thought to use graphite paper. I will be purchasing some soon.. and thank you for allowing us also to use your images for our Bibles. I hope others are getting useful hi ta and tips out of this as much as I am! May continue to bless you on your journey! This course has been helpful and not the least bit intimidating! Loved the Lessons. Thank you. Thank you!!! This has helped a lot!! I’m new to Christianity!! I love the courses, very simple and practical videos. Thanks for putting in the time and effort to teach the basics to those of us that have just started out on our new adventure of bible journaling. I really appreciated it. Great course! I am enjoying it so much! Thanks for making it available for free! Love all of the journaling help & ideas! When I first heard of Bible journaling, I thought, “I’m not an artist. I can’t do this.” Imagine my surprise when I realized that I can use stickers, stencils, tracing and other techniques to create the beautiful pictures. Just in the few days I’ve listened to the videos and taken notes, I’ve been drawn even closer to God. Your Bible Journaling Ministries is a Godsend to me and, I’m sure, others as well. This is great! Thanks for giving me “permission” to keep it simple and to focus on the real reason for journaling!! journaling and this information has been so helpful to get me started on my journey into God’s word. Thank you for keeping it simple and easy because I was beginning to feel so overwhelmed by all the choices from bibles to media and tools. Tracie you voice is also pleasant to listen too ! Thank you, Tracie, for the hard work you’ve so altruistically shared with us. I’m really new to the all ‘Bible journaling’ universe, but I fell in love with the idea very quickly. I’m grateful for the opportunity of getting to know some techniques and methods of biblical journaling through your amazing videos. Thank you so much for sharing them. May the Lord bless your work, as it prospers to His greater glory and the sanctification of our lives. I loved this course! I have had my journaling bible for months now but I was too scared to get started. I loved seeing your videos and it inspired me to just go for it! thanks!! I just needed a little push to get started. I didn’t want anything complicated, just something simple. The instructions are simple and the videos are easy to understand. I am on my way to finding a new way to get into God’s Word, which is what I was looking for. Thank you for the free course, it’s great! I am learning about products I’ve never seen before. Watching you is making me more at ease to start journaling in my Bible. This is a great class. I have a journaling Bible but have had a hard time getting started. This class has helped me with ideas, techniques and the confidence to jump in. Well done Tracie and thank you so much for offering this!!! I really appreciate the ideas of different supplies! It can be overwhelming trying to find the right supplies to start. Love this course! I’m so excited to get started. thank you! I signed up for the courses earlier this year but I’m finally ready to become serious about bible journaling and increasing my time with God. These courses have been very helpful and have removed the overwhelming anxiety I felt with getting started with my journaling. Thank you for sharing. I signed up for the courses at the beginning of year but I’m just making the the time to watch the videos. It is time for me to get serious about journaling and my time with the Lord. These lessons have taken the anxiety away as I start this journey. Thank you for your ministry and sharing your knowledge. I’m new to Bible journaling. I’m a life long crafter and Christian. Just learned about its existence and I’m searching for where Bible journaling courses and found your website. Only half way through the Beginner course. Excited to learn more about it as it’s a new concept for really applicable to my faith walk! Hi Tracie 🙂 So glad I signed up for this course! Thanks again! I just finished lesson 5 and have learned a lot! My favorite part was choosing a Bible. Hello. I absolutely loved the 10 lessons as well as all the free digital downloads. You broke it down perfectly and I am excited to get started on my journey to Bible Journaling. Thanks so much. Thank you so much. I have learnt a lot from your videos! Keep on doing what the Lord has gave you to do. I am actually Afrikaans but you are making everything so easy to follow. Your video’s for beginner’s are so very helpful. I bought the Inspire Bible about a year ago, but really did not know how to get started. Now, I am loving it and find myself having to tear myself away from it! I have only gotten through 5 of the 10 video’s and have learned a ton. Thank you! I just signed up for Momentum subscription service as well. Thank you! Yay! Welcome to the family! I’m enjoying this class very much. I paid for a class last week and have gotten much more out of this class in 5 lessons than I did in that. I look forward to the coming lessons. This was so helpful. I am not an artsy person and after viewing some really gifted bible journalers pictures I felt completely discouraged and “not good enough” to start the process. Thanks to you, I feel more prepared, relaxed and excited to start the journey to being more involved in the Scripture I am studying and add a new level to my studies of the Word. I especially liked the information on what types of bibles there were and how to work in just your standard bible! A big heartfelt thank you! Thank you for making such a wonderful simple course for beginners. It is so helpful and thoughtful. Hi Tracie! This is such a wonderful, encouraging course. I am not a total beginner, but I am still find it very helpful. Thank you SO much! Thank you for this free course on Bible journaling. It is very informative and I look forward to a new session each day! I can hardly wait to get started. Thank you so much, Tracie, for this WONDERFUL course! God bless you for your willingness to share it with us for free. The lessons are so helpful and have taken away my “fear” to draw-paint-doodle in my Bible. I pick out a portion of scripture, read it, meditate on it (sometimes all day), and then see what I am inspired to draw or paint. I made my own Bible mat out of a piece of quilters applique plastic, and it works great! It’s sturdy enough to keep from indenting pages below where I’m working, but light weight enough to fit all the way to where the pages are bound. I find that I really like working with watercolor pencils and then going back with just a bit of water to make them come alive. Also, if your pages get wrinkled from the water, you can smooth them out with your household iron for a few seconds (and not too hot a temperature either). I learned this from another Bible journaling website, and it works well. THANK YOU again for sharing your knowledge with us, and I look forward to continuing my Bible Journaling journey with you! I’m currently on day 5 and so far you have touched on everything I have had questions about. Can not wait for the last 5 lessons. You are very thorough and I appreciate that especially because the 10-day course is free. Thank you and many blessings. I stumbled onto your blog while searching Pinterest for “how-to Bible journal” idea. In the videos you have sent in the course I have learned so much and am super excited! I LOVE anything creative just need the inspirational ideas and did not expect to gain so much knowledge. I have watched several blogs this past week and must say I enjoyed yours the most. Many were just too artistic and I am no so inclined lol. And I surely would not want to mess up any of my bibles, I have several and love each one. Thank you so very much for the wealth of info and inspiration. Your giggle makes me giggle so keep on laughing! And Thank you! I have been really enjoying this course. It is informative and fun. Thank you for this course! It has inspired me and given me confidence that I can deepen my time in The Word whole also creating an heirloom Bible for my granddaughter. May God bless your ministry! I am enjoying this beginners course!!! Thank you for making it available!!! Good morning! I watched the video on tracing this morning, and you stirred up some wonderful childhood memories. I hadn’t heard about carbon paper in years, but we always used it as children. Now I want to go get some! I’m really enjoying your video series, thank you for them. Loved the information gained from the course. I am new to bible Journaling, so it was very informative. Thank you for this great course! It’s a great reinforcement of other techniques that I’ve learned, which means that you’re sharing the best, most accurate information, which I appreciate. Even though i am just beginning, I am really enjoying the videos and freebies. They’re so helpful. I am so excited to start this Bible Journaling journey with you Tracie! I am on lesson 5 and enjoying the course so much. I knew I was a beginner, but I didn’t know how much I didn’t know! 😀 Thank you for offering these tips for free! Love, love learning Bible journaling! Thank you for taking the fear out of Bible journaling. I feel more comfortable knowing that I can use whatever I have lying about to journal, it doesn’t have to be fancy or expensive just as long as I’m getting into the word. I am glad that you have offered these courses for free. I am enjoying them and learning a lot. I love Bible journaling. Looking forward to more of your videos. Thank you Tracie. Thank you so much for this course! I am enjoying journaling in my bible it’s a wonderful way to glorify the Lord. I am easily distracted when I sit to read my bible but this helps to keep me focused and I want to be focused on the Lord without allowing satan to distract me. Thank you for this opportunity to learn a new way to study God’s Word. I’m very new to Bible journaling and a little nervous to start. However, your videos make it easier. I’m looking forward to your next lessons. Hello, I am really enjoying the free video classes on bible journaling. I have to say that I am really excited to start on my journey learning more about the Word of God,and I cannot wait to choose my Bible-my favorites are the Inspire, Creative and Beautiful Word. I love to color! The only thing is that if I purchase the Momentum , I wont be able to print the freebies! Thankyou so much for all the wonderful information on Bible Journaling! Just letting you know that I did not receive Lesson 6 video this morning. I woke up this morning looking forward to my lesson! good, solid information for this newbie. i am looking forward to more indepth classes in the future. All the courses are emailed to you. If you are missing one contact Customer Support @ Support@BibleJournalingMinistries.com and the can resend you the ones you are missing. Glad you are enjoying them! Great course, would recommend it for everyone! This is a great course to learn bible journaling; especially boosting inspirations! I just finished the free 10 lesson course. I started Bible Journaling about a year ago. I did find this course still helpful. It was nice to hear of the different products and ideas and some new things to try. Wish I could take more with Tracie but can not at this time. I will check out your youtube channel though. Thank you for all you do and blessings to you and your family. Yes,I definitely enjoyed all of the classes-they were all very informative information for a beginner’s course. I am so excited to start journaling and learning while appreciating the Word of God. I tried sending a review and recommendation on FB, but for some reason it was not letting me. On the recommendation, it was telling to either click Public, only friends on FB, or just me. I clicked Public, but would not let me post. And I was not sure about rating the classes-on where to click. But, it is a thumbs up! Rating it a big 10! I’m loving this course, especially the tracing video I just seen because I can’t draw this will help me. Thank you for helping me grow in the word!! So far I’m loving the beginner course. Thank you for making it available free. I love the videos so if I don’t understand something I can watch itagain. Hi! I have a couple of questions. First, I don’t understand how to print the kits so that they become stickers. I understand that I buy sticker paper and print them on that, but then, wouldn’t I have to cut them out? I am missing something! Also, can you tell me what kind of acrylic pens you are using in the first Bible Journaling lesson on the I am Loved course? Thank you! Thank you for offering this amazing free course for beginners! I have been wanted to do Bible Creatuve Journaling for a while now, but I didn’t know how or where to start. Your videos have given me tons of ideas and inspirations! Thanks! I pray that God will continue to bless you in your creativity and wisdom. I’ve been Bible Journaling for almost a year if not longer and I practically taught myself by watching several YouTube videos but the other day I ran into one of your videos where you were talking about the different kind of bibles from 2018 and I really enjoyed that video so much that I bought the Inspired One Year bible lol, then I started watching more of your videos and decided to subscribe to your lessons and so far I have really enjoyed them!! Thank you so much for your ministry!! God Bless!! I’ve just been introduced to Scripture journaling and this is SUCH a great site! I’m enjoying the free course offered, and all the posts to explore! The prinatables are so helpful as well! What a fun way to connect with the Word of God! I loved the 10 Free Bible Journaling Courses! It really helped me with so many questions that I have since I am brand new to this. Thank you so much for taking the time to share all your great ideas with us and I absolutely love all the FREE downloads. I’ve learned so much from lessons one through five. These lessons have been very insightful I’m learning that being creative is okay and that it’s okay to express myself even in my Bible and if it helps me to learn all the better. I’ve learned what supplies I will need (gel pens, a page protector, and coloring pencils) and which journaling Bible will suit me best. Thanks for offering this course it has been a godsend. I am so enjoying the Beginners Course! Love the practical, step-by-step approach! Thank you! I’m learning quite a bit. I never thought I could be creative inside my bible. Now I’m inspired to do this with love. God bless you!! I love these videos! I enjoy watching them and tips are great! Thank you so much for the free videos they are a blessing! You asked for comments, so here goes. Thank you so much for the free beginners course. I havent started yet, but will soon. I’ve been busy travelling and visiting family as my grandson is involved in the basketball tourney. His team won semi-state and will be in the championship games next weekend. Our teen quiz team will be studying Hebrews and I and II Peter this year. I’m hoping to design some 8 1/2 x 11 posters of some of their memory verses for them to color. I feel like it will help them to memorize the verse they’re coloring. Thank you for this course for beginners. I received a journaling bible for Christmas but didn’t know how to start. I especially needed the second video on how to find scripture and now know how I’m going to begin. Looking forward to the rest of the course. Thank you so much for this course. It has helped so much! The video of the mats was very helpful. The wranger mat i will have to look into..Thank you so much for the info.. This course has been enormously inspirational – and I’ve only been through five sessions! I can’t wait to get started Bible journaling! I’m thinking of starting a group at my church. I know the women there will love it too! Loving the info in this article! Thanks so much for all the effort. Thank you for all the inspirational videos. They have helped me get started with my own Bible journaling. What an amazing website.